Thoroughly water any plants near the area where you will be working. 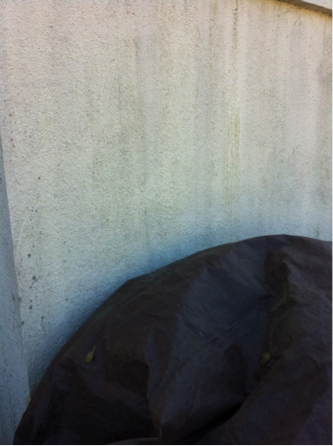 Protect larger plants by covering them with plastic sheeting. 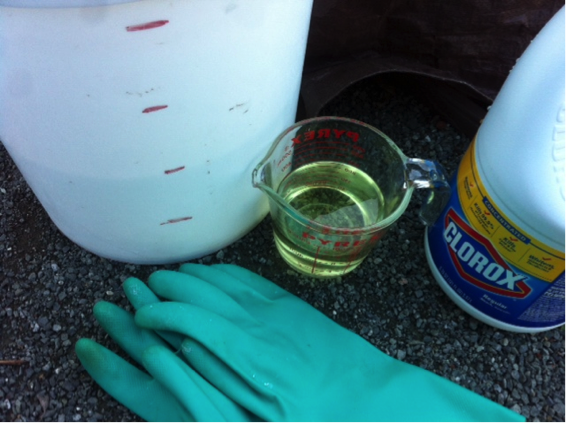 Add ¾ cup Clorox® Regular-Bleach2 with CLOROMAX® to 1 gallon water in the 5 gallon bucket. For larger jobs, use 1½ cups bleach added to 2 gallons of water. 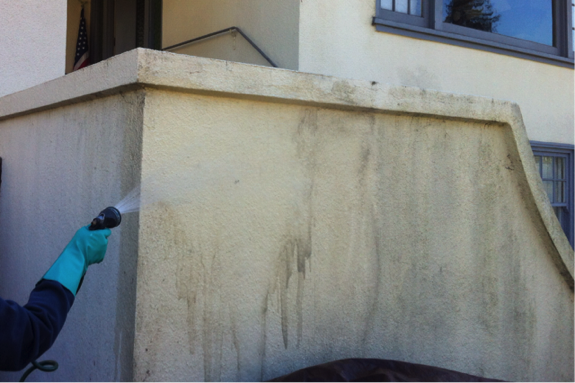 Apply the bleach and water solution to the surface with a scrub brush. Any leftover bleach and water solution can be easily flushed down the toilet. 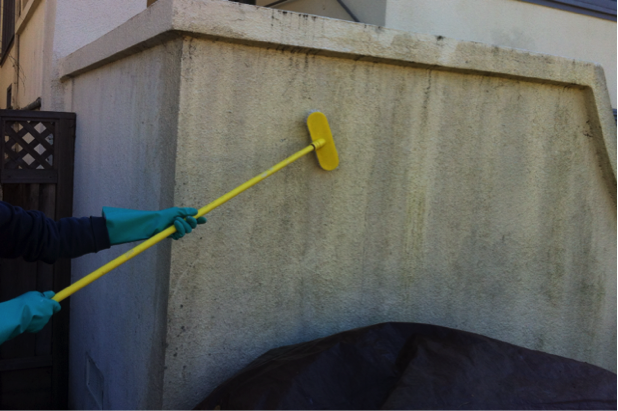 Rinse out your brushes and rinse off your gloves and boots with the garden hose, and let everything air dry. 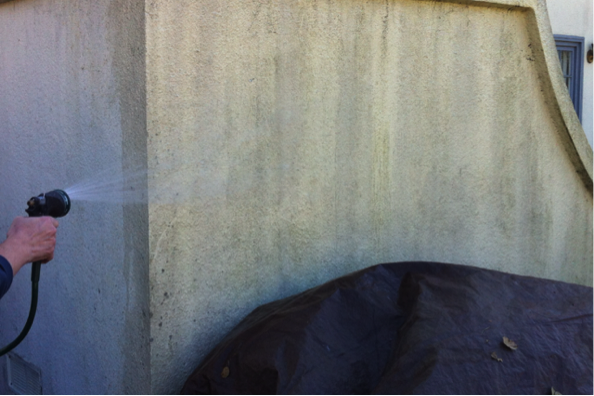 You can also use this technique to clean siding, as well as sealed brick and patio stones. 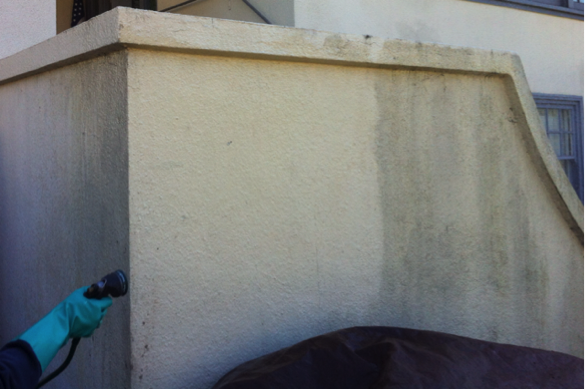 Note that you should avoid applying the bleach solution in direct sunlight or to unfinished wood. 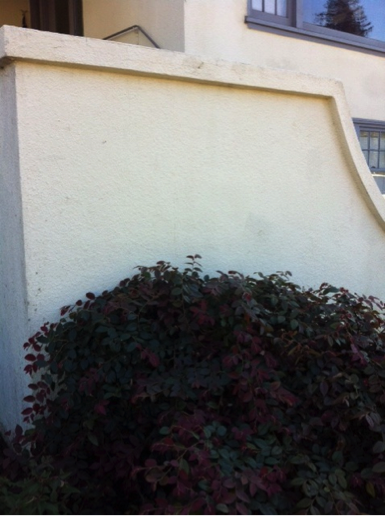 The solution should not be used for aluminum gutters or windows; rinse thoroughly if any contact occurs. You should also test the bleach solution on the area you want to treat in an inconspicuous area before starting your project. Sure, it sounds easy enough, and really, it actually is! Here’s a picture tutorial to help you see how it’s done. 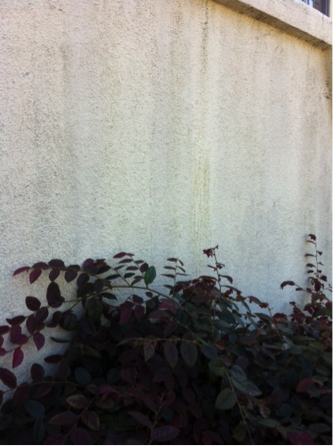 Mold and mildew builds up a little at a time over the winter. There’s less daylight and lousy weather, making it easier to put off dealing with (until you can’t any longer!). 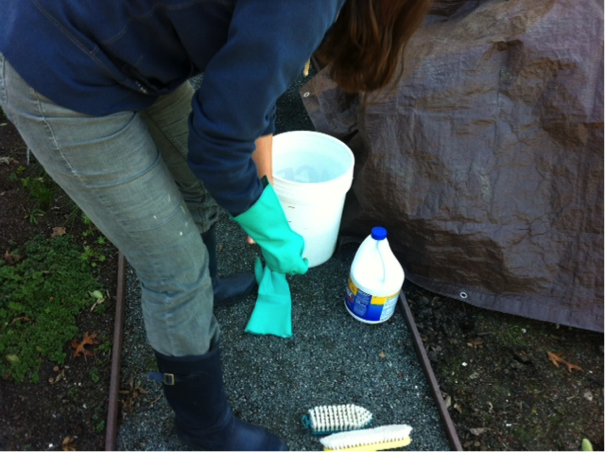 Use a large plastic tarp to protect the plants. To make up 2 gallons of the bleach solution, use 1½ cups of bleach. This makes it easier to dip a long handled brush into the solution. Measure water into the bucket and mark volume lines on the outside so it’s easy to just use the hose to fill the bucket to the correct volume. No guessing as to how much a gallon is! Wet the surface with a garden hose. When it’s wet, the discoloration looks even worse. The less you have to think about what you are wearing while you are working the better. Rubber rain boots and old clothes that you won’t mind getting any bleach splashes on are perfect. 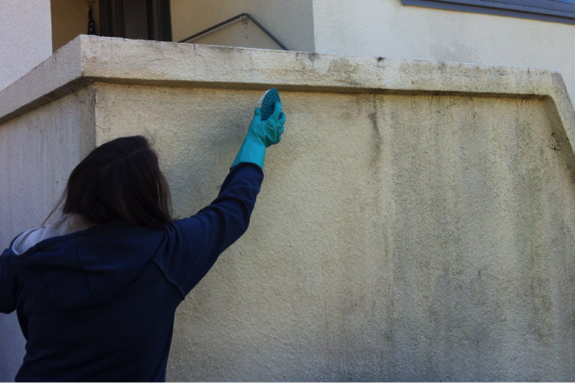 Use a long-handled brush to apply (and reapply by just dipping the brush back in the bucket) the bleach solution to the wall. If you have a large area to clean, don’t try to do it all at once. To stay within the recommended 5 minutes of contact time, work in smaller sections, rinsing the first area before starting again on the next. Wow — what a difference! Thanks, Clorox® Regular-Bleach! I couldn’t have done it without you!